Emma is riding in a rickshaw being drawn by Steed. "Three o'clock!" A missing scientist suddenly turns up at his home virtually brain-dead, then disappears again, just as suddenly—in a laundry truck. 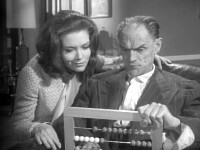 Steed takes on the guise of Mr. Gourmet in order to reach Max Chessman, a hotel tycoon suspected of using his hotel empire as a cover for a brainwashing service. This one loses points big time for, among many other things, a serious a waste of talent—Peter Jeffrey and Peter Arne were both saddled with trivial, thankless parts, not to mention stuntmen in very bad Chinese makeup (have a look). Plus, Max Chessman is a decidedly un-intimidating mastermind, which robs the climax of tension. Still, Steed is enjoyable as Mr. Gourmet, carrying on about the butter being salted, and Emma makes an appearance sporting a rare hair style. And Philip Latham turns in a four-bowler performance as the thoroughly unflappable Carter. Exclusive: Writer Roger Marshall has penned an essay about his tenure on The Avengers. After Steed announces he'll be dining with Max Chessman, Emma comments, "Well, don't come to me for the bicarbonate of soda."